November 27, 2009 - On Wednesday Gulfstream Aerospace, newest business jet and the flagship of its fleet, the ultra-large-cabin, ultra-long-range Gulfstream G650, successfully completed its first flight. Flown by experimental test pilot Jake Howard and senior experimental test pilot Tom Horne, the G650 took off from Savannah Hilton Head International Airport at 1:41 p.m. local time with flight engineer Bill Osborne. Because pilots were alerted to a slight vibration in a landing gear door, they curtailed the testing regimen as a precautionary measure. The aircraft landed 12 minutes later. Under its own power, the G650 rolled out of the Savannah manufacturing facility on Sept. 29, 2009. 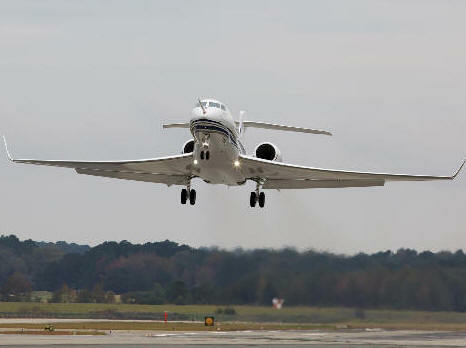 Gulfstream G650 remains on schedule for type certification by 2011, followed by entry-into-service in 2012. The G650 offers the longest range at the fastest speed in its class. Powered by best-in-class Rolls-Royce BR725 engines, the business jet is capable of traveling 7,000 nautical miles at 0.85 Mach and has a maximum operating speed of 0.925 Mach. Its 7,000-nautical-mile range means the G650 can fly nonstop from Dubai to Chicago. With an initial cruise altitude of 41,000 feet at 0.85 Mach, the G650 can climb to a maximum altitude of 51,000 feet and avoid traffic and inclement weather. With its all-new aerodynamically optimized wing, the G650 can meet the latest takeoff certification requirements. At maximum takeoff weight, the aircraft can depart from a 6,000-foot runway. Passenger comfort is one of the G650’s main attributes. The aircraft features the largest purpose-built business-jet cabin, which leaves room for larger galleys and lavatories, and increased storage. The jet, which seats 11-18 passengers, also has 16 Gulfstream-signature oval windows that measure 28 by 20.5 inches, the biggest in the industry. The G650 provides the most productive cabin environment. A cabin altitude of 4,850 feet at FL510 and 3,300 feet at FL410 reduces fatigue, increases mental alertness and enhances productivity. A quieter cabin allows for a better environment for conversation or relaxation. The aircraft comes with the new Gulfstream Cabin Essential™ package, so a single-point failure will not result in the loss of functionality. That means a toilet always flushes; water is always available; and an entertainment source always works. Additionally, the G650 features the PlaneView™ II cockpit, the most advanced flight deck in business aviation, and an Advanced Health and Trend Monitoring System (AHTMS) to support aircraft maintenance planning and enhance availability.